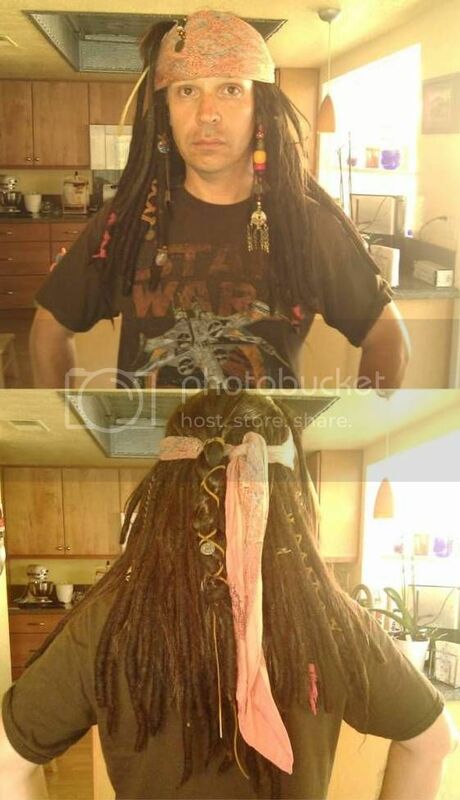 a little later a guy put his home made wig up for sale and these were his pics. He had said that he made the entire thing himself - including the beads. 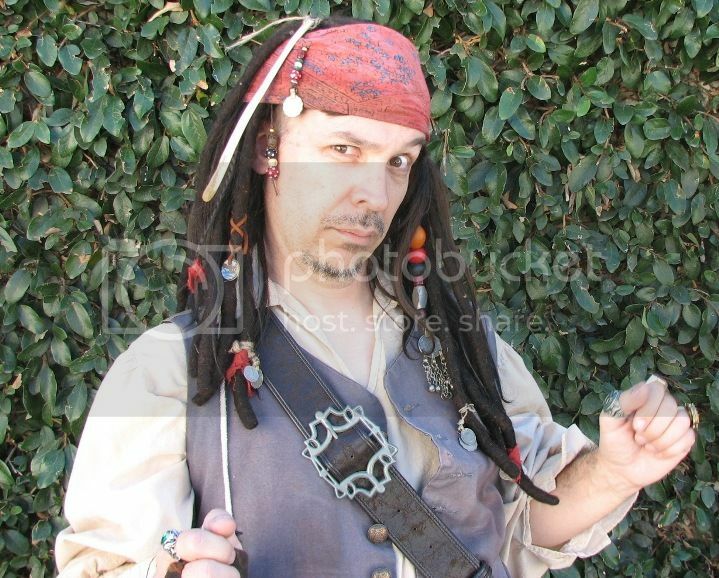 In fact, the only things that I think he bought were the bandanna and the sea coin. However, once I got it - I began to find more and more that I didn't like about it. 2. not enough dreads for me, it looked too close to a movie 1 wig. 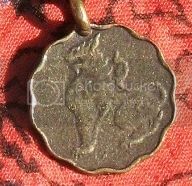 3. the piece of eight as well as all of the coins were made from tribal belly dancing coins that Jack doesn't wear. So I bought a Ms Mazie Kuchi from a Jack here at KTTC (Tall CJ? 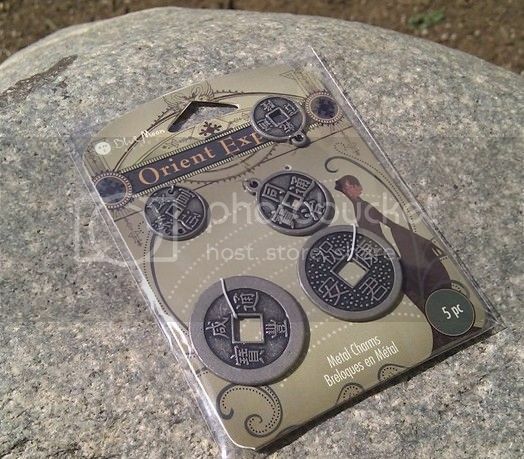 ), bought a new bandanna, bought a Master Replica piece of eight from Amazon and waited for everything to arrive. 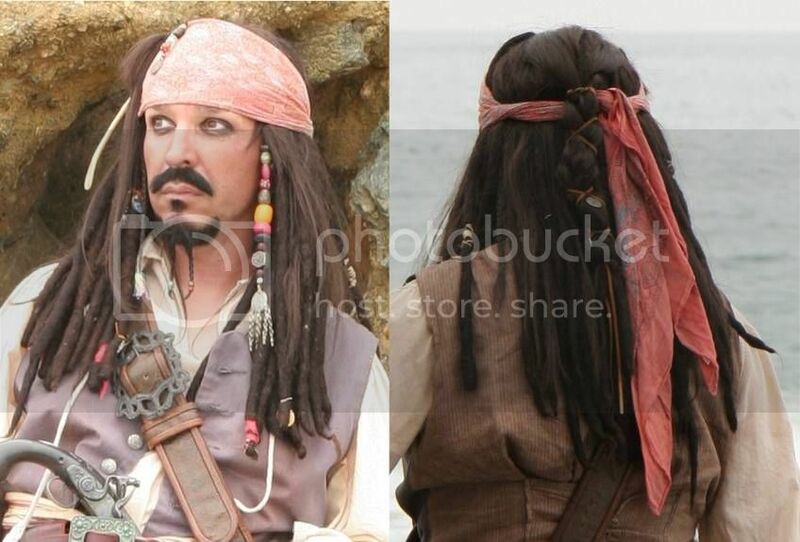 Once I had two of everything, I put the old stuff on my first costume base wig - put it all together and sold this as a "close Jack wig"
It was also at that time, that we took the side pony tail and cut it shorter so that it would stand up. 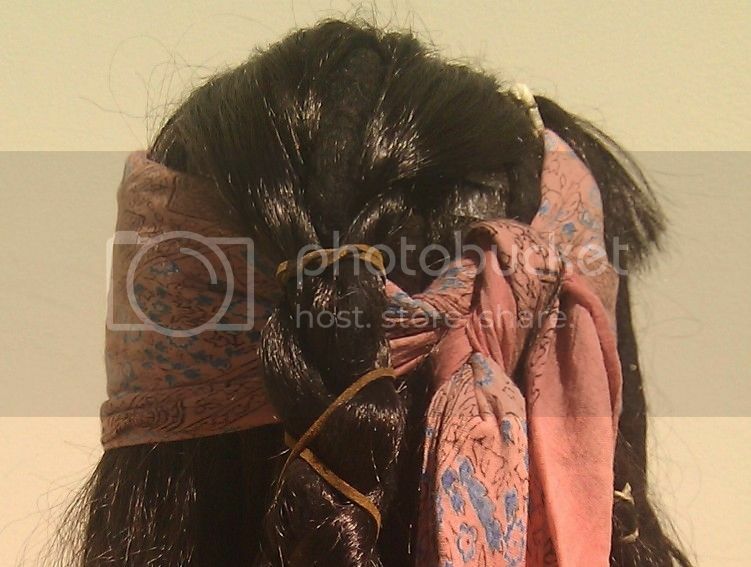 But notice that the wig ties and hair coins are the same. Personally I don't like the fact that they are identical to the piece of eight coin, so I left them as just two scallops. The sail needle is an actual bone and came from the original wig. It's thinner and less round than Jack's, but I like it because it's very lightweight. After I spent a few days and put those all in the right place. My wife later went through and retied my back pony tail and leather braid. 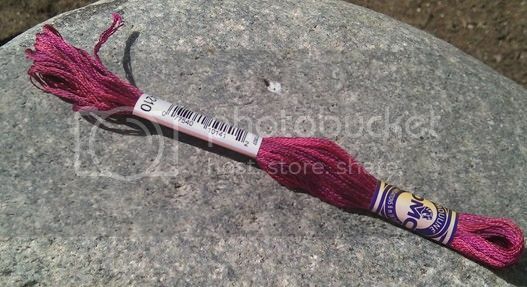 We took some of the extra fly away hair that fell in front of the Kuchi dandle and used a disposable razor to create "wispy side bangs" that poke out from under the bandanna. Now that the new back braid is done, we created some new open pockets where you can see the wig netting, but with my own brown hair underneath... so I may be getting a second rasta wig here in a week or so and adding some more dreads to fill in the empty space. I can take hi-res of anything, answer questions or whatever. 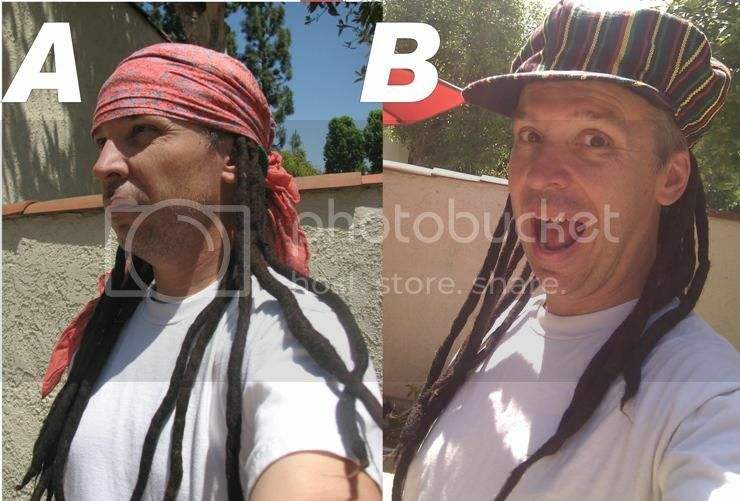 3 Rasta wigs and a light wave brown wig - and you can make your own Jack wig - with all of the alterations I have put in, it hasn't been worth the initial purchase. Not when I have replaced everything and added 2x the amount of dreads. 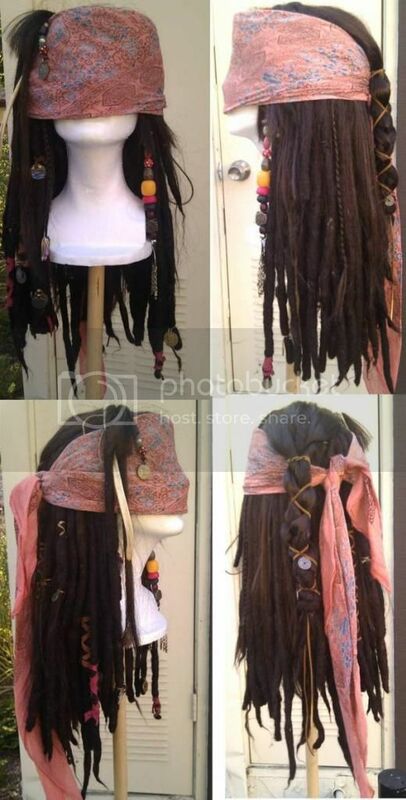 In fact, doing my own research - you could buy the dreads, the brown base wig, the bandanna and the 3 bead dangles for about $130 shipped. Then it would just be assembly and the remaining random coins and ties. 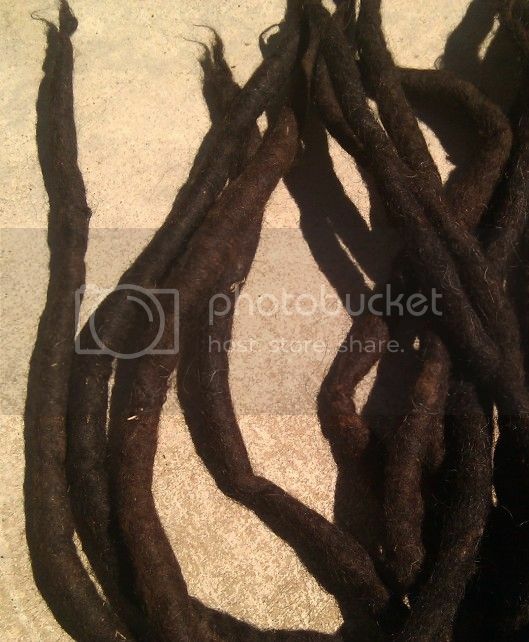 Some of you asked about the rasta wigs, and there is definitely a cheaper type of dread out there that looks like yarn, or twisted hair. Much more better wig with 45 dreads.... blast now I need to move some coins around..
who can spot the non-SA element we added?